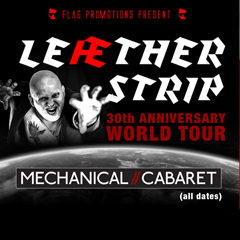 OFFICIAL STATEMENT FROM FLAG PROMOTIONS Sadly due to reasons beyond our control we have had to cancel And One from this tour, (a fuller explanation will be available on request to Flag Promotions) All Original And One Tickets will be honoured for this new Lether Strip headliner Tour/Show with a 1 (so 1 And One Ticket lives up to it's name and now admits 2 to the Show) as an extra incentive to keep your tickets or refunds will be offered, if preferred at point of purchase! New tickets for this show/Tour are now just £15 at all venues / £20 on the door! The 2 for 1 deal only applies to old tickets as the new ones are cheaper. LEAETHER STRIP is the solo-project of Danish electronic industrial artist Claus Larsen. Formed in 88, and quickly signed by the legendary German Electro Label Zoth Ommog in 1989, LEAETHER STRIP quickly built a buzz as one of the most exciting emerging acts in Europe in the early 90s. LEAETHER STRIP has been and still is a big inspiration to many of todays younger acts and is still one of the most productive and most busy live acts in the scene. LEAETHER STRIP concerts are always highly energetic and aggresive. 2018 marks the 30th anniversary of LEAETHER STRIP and a world tour to follow.